4 pp. Roman, 71 pp. Nowadays food, drinks, and almost every aspect of nutrition has become a very popular topic. At no time the wealth of cook books, diet advices, wellness food, seminars according wine or whiskey and telecasts with today even famous cooks were as immense as they are now. We can choose between European, African, Asian, oriental or Latin-American dishes, American fast food, gourmet or rustic cuisine, diets, uncooked vegetarian and organic food. Is “good food” only affordable for a small minority? 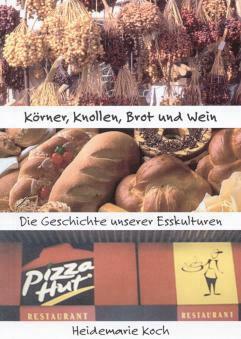 Societies split up in diverse culinary groups: gourmets, "cheap eater", diet-believer, vegetarians etc. Only few people have knowledge of our nourishment, its history, and its cultural backgrounds. Aim of the present book is the presentation and demonstration of the most important aspects of the opulence as well as the deficits of our foods, the history and actual trends of nutrition, food all over the world, and influences of religion on cuisines or eating habits. Heidemarie Koch was raised in Wuppertal/Germany since 1948. After an apprenticeship as an industrial clerk she made some language studies, worked in European countries, studied social sciences and economics, art pedagogy, and African studies (“Afrikanologie” at that time). In the 1980s she performed educational work in developmental politics. Until her retirement she was director of the Anthropological Museum of the UEM United Evangelic Mission in Wuppertal (“Völkerkundemuseum der Vereinten Evangelischen Mission Wuppertal“). She made extensive travels through Europe, North and South America, Africa, and Asia. Since 2005 she works freelance in intercultural and exhibition projects. Farm holidays in her childhood, and six months working and living at a farm in French Switzerland motivated her engagement in organic / dynamic agriculture, organic and One World stores as well as her intensive preoccupation with nutrition.